Follow this Chicago Hot Dogs recipe for the kind of franks you'd find at any Windy City ballpark. Top these hot dogs with tomatoes, peppers and relish. Cook franks as directed on package. Fill buns with franks; place 2 tomato wedges on one side of each frank and 1 pickle piece on other side. 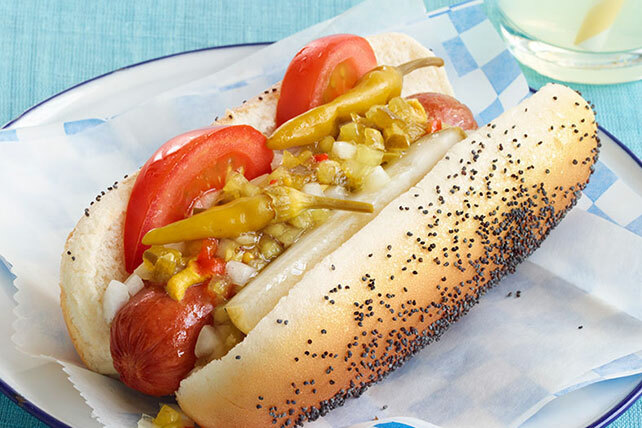 For a Midwestern touch, finish these hot dogs with a shake of celery salt. While the traditional Chicago-style hot dog is boiled, you can also grill the franks for these tasty sandwiches.